This article is about the pope who was canonized. For other uses, see St. Pius X (disambiguation). Pope Pius X (Italian: Pio), born Giuseppe Melchiorre Sarto[a] (Italian: [dʒuˈzɛppe melˈkjɔrre ˈsarto]; 2 June 1835 – 20 August 1914), was head of the Roman Catholic Church from August 1903 to his death in 1914. Pius X is known for vigorously opposing modernist interpretations of Catholic doctrine, promoting liturgical reforms and orthodox theology. He directed the production of the 1917 Code of Canon Law, the first comprehensive and systemic work of its kind. Pius X was devoted to the Marian title of Our Lady of Confidence; while his papal encyclical Ad diem illum took on a sense of renewal that was reflected in the motto of his pontificate. He advanced the Liturgical Movement as the only Pope to favor the use of the vernacular language in teaching catechesis, he encouraged the frequent reception of holy communion, and he lowered the age for First Communion, which became a lasting innovation of his papacy. In addition, he strongly defended the Catholic religion against indifferentism and relativism. Like his predecessors, he promoted Thomism as the principal philosophical method to be taught in Catholic institutions. As Roman Pontiff, he vehemently opposed modernism and various nineteenth-century philosophies, which he viewed as an import of secular errors incompatible with Catholic dogma. Pius X was known for his overall rigid demeanor and sense of personal poverty. He frequently gave homily sermons in the pulpit every week, a rare practice at the time. [b] After the 1908 Messina earthquake he filled the Apostolic Palace with refugees, long before the Italian government acted. He rejected any kind of favours for his family, to which his close relatives chose to remain in poverty living near Rome. During his pontificate, many famed Marian images were granted a canonical coronation, namely the Our Lady of Aparecida, Our Lady of the Pillar, Our Lady of the Cape, Our Lady of Chiquinquira of Colombia, Our Lady of the Lake of Mexico, Our Lady of La Naval de Manila, Virgin of Help of Venezuela, Our Lady of Carmel of New York, and the Immaculate Conception within the Chapel of the Choir inside Saint Peter's Basilica were granted its prestigious honors. After his death, a strong cult of devotion followed his reputation of piety and holiness. He was beatified in 1951 and was canonized as a Catholic saint on 29 May 1954. The traditionalist Catholic priestly Society of Saint Pius X is named in his honor while a grand statue bearing his name stands within St. Peter's Basilica; and his birth town was renamed Riese Pio X after his death. 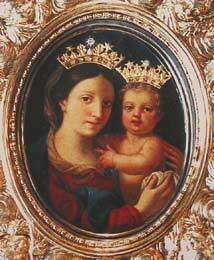 The Marian image of Our Lady of Confidence, for whom Pius X had a religious devotion. The Basilica of Saint John Lateran. Giuseppe Melchiorre Sarto was born in Riese, Kingdom of Lombardy-Venetia, Austrian Empire (now Italy, province of Treviso) in 1835. He was the second born of ten children of Giovanni Battista Sarto (1792–1852) and Margarita Sanson (1813–1894). He was baptised 3 June 1835. Giuseppe's childhood was one of poverty, being the son of the village postman. Though poor, his parents valued education, and Giuseppe walked 3.75 miles (6.04 km) to school each day. Giuseppe had three brothers and six sisters: Giuseppe Sarto (born 1834; died after six days), Angelo Sarto (1837–1916), Teresa Parolin-Sarto (1839–1920), Rosa Sarto (1841–1913), Antonia Dei Bei-Sarto (1843–1917), Maria Sarto (1846–1930), Lucia Boschin-Sarto (1848–1924), Anna Sarto (1850–1926), Pietro Sarto (born 1852; died after six months). He rejected any kind of favours for his family; his brother remained a postal clerk, his favourite nephew stayed on as village priest, and his three single sisters lived together close to poverty in Rome, in the same way as other people of the same humble background lived. At a young age, Giuseppe studied Latin with his village priest, and went on to study at the gymnasium of Castelfranco Veneto. "In 1850 he received the tonsure from the Bishop of Treviso, and was given a scholarship [from] the Diocese of Treviso" to attend the Seminary of Padua, "where he finished his classical, philosophical, and theological studies with distinction". On 18 September 1858, Sarto was ordained a priest, and became chaplain at Tombolo. While there, Sarto expanded his knowledge of theology, studying both Thomas Aquinas and canon law, while carrying out most of the functions of the parish pastor, who was quite ill. In 1867, he was named archpriest of Salzano. Here he restored the church and expanded the hospital, the funds coming from his own begging, wealth and labour. He became popular with the people when he worked to assist the sick during the cholera plague that swept into northern Italy in the early 1870s. He was named a canon of the cathedral and chancellor of the Diocese of Treviso, also holding offices such as spiritual director and rector of the Treviso seminary, and examiner of the clergy. As chancellor he made it possible for public school students to receive religious instruction. As a priest and later bishop, he often struggled over solving problems of bringing religious instruction to rural and urban youth who did not have the opportunity to attend Catholic schools. In 1878, Bishop Federico Maria Zinelli died, leaving the Bishopric of Treviso vacant. Following Zinelli's death, the canons of cathedral chapters (of whom Sarto was one) inherited the episcopal jurisdiction as a corporate body, and were chiefly responsible for the election of a vicar-capitular who would take over the responsibilities of Treviso until a new bishop was named. In 1879, Sarto was elected to the position, in which he served from December of that year to June 1880. After 1880, Sarto taught dogmatic theology and moral theology at the seminary in Treviso. On 10 November 1884, he was appointed bishop of Mantua by Leo XIII. He was consecrated six days later in Rome in the church of Sant'Apollinare alle Terme Neroniane-Alessandrine, Rome, by Cardinal Lucido Parocchi, assisted by Pietro Rota, and by Giovanni Maria Berengo. He was appointed to the honorary position of assistant at the pontifical throne on 19 June 1891. Sarto required papal dispensation from Pope Leo XIII before episcopal consecration as he lacked a doctorate, making him the last Pope without a doctorate before Pope Francis. Pope Leo XIII made him a cardinal in an open consistory on 12 June 1893. He was created and proclaimed as Cardinal-Priest of San Bernardo alle Terme. Three days after this, Sarto was privately named Patriarch of Venice. His name became public two days later. This caused difficulty, however, as the government of the reunified Italy claimed the right to nominate the patriarch based on its previous alleged exercise by the Emperor of Austria. The poor relations between the Roman Curia and the Italian civil government since the annexation of the Papal States in 1870 placed additional strain on the appointment. The number of vacant sees soon grew to 30. Sarto was finally permitted to assume the position of patriarch in 1894. As cardinal-patriarch, Sarto avoided political involvement, allocating his time for social works and strengthening parochial banks. However, in his first pastoral letter to the Venetians, Sarto argued that in matters pertaining to the pope, "There should be no questions, no subtleties, no opposing of personal rights to his rights, but only obedience." On 20 July 1903, Leo XIII died, and at the end of that month the conclave convened to elect his successor. According to historians, the favorite was the late pope's secretary of state, Cardinal Mariano Rampolla. On the first ballot, Rampolla received 24 votes, Gotti had 17 votes, and Sarto 5 votes. On the second ballot, Rampolla had gained five votes, as did Sarto. The next day, it seemed that Rampolla would be elected. However, the veto (jus exclusivae) against Rampolla's nomination, by Polish Cardinal Jan Puzyna de Kosielsko from Kraków in the name of Emperor Franz Joseph (1848–1916) of Austria-Hungary, was proclaimed. Many in the conclave, including Rampolla, protested against the veto, and it was even suggested that he be elected pope despite the veto. However, the third vote had already begun, and thus the conclave had to continue with the voting, which resulted in no clear winner, though it did indicate that many of the conclave wished to turn their support to Sarto, who had 21 votes upon counting. The fourth vote showed Rampolla with 30 votes and Sarto with 24. It seemed clear that the cardinals were moving toward Sarto. On the following morning, the fifth vote of the conclave was taken, and the count had Rampolla with 10 votes, Gotti with two votes, and Sarto with 50 votes. Thus, on 4 August 1903, Sarto was elected to the pontificate. This marked the last time a veto would be exercised by a Catholic monarch in the proceedings of the conclave. At first, it is reported, Sarto declined the nomination, feeling unworthy. Additionally, he had been deeply saddened by the Austro-Hungarian veto and vowed to rescind these powers and excommunicate anyone who communicated such a veto during a conclave. With the cardinals asking him to reconsider, it is further reported, he went into solitude, and took the position after deep prayer in the Pauline chapel and the urging of his fellow cardinals. In accepting the papacy, Sarto took as his papal name Pius X, out of respect for his recent predecessors of the same name, particularly that of Pope Pius IX (1846–1878), who had fought against theological liberals and for papal supremacy. Pius X's traditional coronation took place on the following Sunday, 9 August 1903. Upon being elected pope he was also formally the Grand Master of the Equestrian Order of the Holy Sepulchre of Jerusalem, prefect of the Supreme Sacred Congregation of the Holy Office, and prefect of the Sacred Consistorial Congregation. There was however a cardinal-secretary to run these bodies on a day-to-day basis. An official photograph of Pius X wearing Papal regalia on 14 August 1903. Pope Pius X resting in the Vatican Gardens. The pontificate of Pius X was noted for its conservative theology and reforms in liturgy and church law. In what became his motto, the Pope stated in 1903 that his papacy would undertake Instaurare Omnia in Christo, or "to restore all things in Christ." In his first encyclical (E supremi apostolatus, 4 October 1903), he stated his overriding policy as follows: "We champion the authority of God. His authority and Commandments should be recognized, deferred to, and respected." When chided by Rome's social leaders for refusing to make his peasant sisters papal countesses, he responded: "I have made them sisters of the Pope; what more can I do for them?" He developed a reputation as being very friendly with children. He carried candy in his pockets for the street urchins in Mantua and Venice, and taught catechism to them. During papal audiences, he would gather children around him and talk to them about things that interested them. His weekly catechism lessons in the courtyard of San Damaso in the Vatican always included a special place for children, and his decision to require the Confraternity of Christian Doctrine in every parish was partly motivated by a desire to reclaim children from religious ignorance. Pius X promoted daily communion for all Catholics, a practice that was criticized for introducing irreverence. In his 1904 encyclical Ad diem illum, he views Mary in the context of "restoring everything in Christ". Spiritually we all are her children and she is the mother of us, therefore, she is to be revered like a mother. Christ is the Word made Flesh and the Savior of mankind. He had a physical body like every other man: and as savior of the human family, he had a spiritual and mystical body, the Church. This, the Pope argues has consequences for our view of the Blessed Virgin. She did not conceive the Eternal Son of God merely that He might be made man taking His human nature from her, but also, by giving him her human nature, that He might be the Redeemer of men. Mary, carrying the Savior within her, also carried all those whose life was contained in the life of the Savior. Therefore, all the faithful united to Christ, are members of His body, of His flesh, and of His bones from the womb of Mary like a body united to its head. Through a spiritual and mystical fashion, all are children of Mary, and she is their Mother. Mother, spiritually, but truly Mother of the members of Christ (S. Aug. L. de S. Virginitate, c. 6). Within three months of his coronation, Pius X published his motu proprio Tra le sollecitudini. Classical and Baroque compositions had long been favoured over Gregorian chant in ecclesiastical music. The Pope announced a return to earlier musical styles, championed by Lorenzo Perosi. Since 1898, Perosi had been Director of the Sistine Chapel Choir, a title which Pius X upgraded to "Perpetual Director". The Pope's choice of Joseph Pothier to supervise the new editions of chant led to the official adoption of the Solesmes edition of Gregorian chant. In his papacy, Pius X worked to increase devotion in the lives of the clergy and laity, particularly in the Breviary, which he reformed considerably, and the Mass. Besides restoring to prominence Gregorian Chant, he placed a renewed liturgical emphasis on the Eucharist, saying, "Holy Communion is the shortest and safest way to Heaven." To this end, he encouraged frequent reception of Holy Communion. This also extended to children who had reached the "age of discretion", though he did not permit the ancient Eastern practice of infant communion. He also emphasized frequent recourse to the Sacrament of Penance so that Holy Communion would be received worthily. Pius X's devotion to the Eucharist would eventually earn him the honorific of "Pope of the Blessed Sacrament", by which he is still known among his devotees. In 1910, he issued the decree Quam singulari, which changed the age at which communion could be received from 12 to 7 years old, the age of discretion. The pope lowered the age because he wished to impress the event on the minds of children and stimulate their parents to new religious observance; this decree was found unwelcome in some places due to the belief that parents would withdraw their children early from Catholic schools, now that First Communion was carried out earlier. Pius X said in his 1903 motu proprio Tra le sollecitudini, "The primary and indispensable source of the true Christian spirit is participation in the most holy mysteries and in the public, official prayer of the church." He also sought to modify papal ceremonies to underscore their religious significance by eliminating occasions for applause. For example, when entering his first public consistory for the creation of cardinals in November 1903, he was not carried above the crowds on the sedia gestatoria as was traditional. He arrived on foot wearing a cope and mitre at the end of the procession of prelates "almost hidden behind the double line of Palatine Guards through which he passed". Pope Leo XIII had sought to revive the inheritance of Thomas Aquinas, 'the marriage of reason and revelation', as a response to secular 'enlightenment'. Under the pontificate of Pius X neo-Thomism became the blueprint for an approach to theology. Perhaps the most controversial aspect of Pius X's papacy was his vigorous condemnation of what he termed 'Modernists' and 'Relativists', whom he regarded as dangers to the Catholic faith (see for example his oath against modernism). He also encouraged the formation and efforts of Sodalitium Pianum (or League of Pius V), an anti-Modernist network of informants, which was seen negatively by many people, due to its accusations of heresy against people on the flimsiest evidence. This campaign against Modernism was run by Umberto Benigni, in the Department of Extraordinary Affairs in the Secretariat of State, which distributed anti-Modernist propaganda and gathered information on "culprits". Benigni had his own secret code — Pius X was known as Mama. Pius X in his study while receiving a portraiture. Nearby is a statue of John Vianney. Pius X's attitude toward the Modernists was uncompromising. Speaking of those who counseled compassion to the "culprits" he said: "They want them to be treated with oil, soap and caresses. But they should be beaten with fists. In a duel, you don't count or measure the blows, you strike as you can." The movement was linked especially to certain Catholic French scholars such as Louis Duchesne, who questioned the belief that God acts in a direct way in the affairs of humanity, and Alfred Loisy, who denied that some parts of Scripture were literally rather than perhaps metaphorically true. In contradiction to Thomas Aquinas they argued that there was an unbridgeable gap between natural and supernatural knowledge. Its unwanted effects, from the traditional viewpoint, were relativism and scepticism. Modernism and relativism, in terms of their presence in the church, were theological trends that tried to assimilate modern philosophers like Immanuel Kant as well as rationalism into Catholic theology. Modernists argued that beliefs of the church have evolved throughout its history and continue to evolve Anti-Modernists viewed these notions as contrary to the dogmas and traditions of the Catholic Church. In a decree, entitled Lamentabili sane exitu (or "A Lamentable Departure Indeed"), issued on 3 July 1907, Pius X formally condemned 65 Modernist or Relativist propositions concerning the nature of the church, revelation, biblical exegesis, the sacraments, and the divinity of Christ. That was followed by the encyclical Pascendi dominici gregis (or "Feeding the Lord's Flock"), which characterized Modernism as the "synthesis of all heresies." Following these, Pius X ordered that all clerics take the Anti-Modernist oath, Sacrorum antistitum. Pius X's aggressive stance against Modernism caused some disruption within the church. Although only about 40 clerics refused to take the oath, Catholic scholarship with Modernistic tendencies was substantially discouraged. Theologians who wished to pursue lines of inquiry in line with Secularism, Modernism, or Relativism had to stop, or face conflict with the papacy, and possibly even excommunication. Gala Berlin with throne produced in Rome by the Casalini brothers, renowned carriage manufacturers, during the papacy of Pius IX, whose coat of arms is painted on both doors. As shown by the emblems of Pius IX and Pius X, painted on the right and left doors respectively, the carriage was used during various pontificates until the beginning of the twentieth century. In 1905, Pius X in his letter Acerbo nimis mandated the existence of the Confraternity of Christian Doctrine (catechism class) in every parish in the world. The Catechism of Pius X is his realisation of a simple, plain, brief, popular catechism for uniform use throughout the whole world; it was used in the ecclesiastical province of Rome and for some years in other parts of Italy; it was not, however, prescribed for use throughout the universal church. The characteristics of Pius X were "simplicity of exposition and depth of content. Also because of this, Pius X's catechism might have friends in the future." The catechism was extolled as a method of religious teaching in his encyclical Acerbo nimis of April 1905. The Catechism of Saint Pius X was issued in 1908 in Italian, as Catechismo della dottrina Cristiana, Pubblicato per Ordine del Sommo Pontifice San Pio X. An English translation runs to more than 115 pages. Asked in 2003 whether the almost 100-year-old Catechism of Saint Pius X was still valid, Cardinal Joseph Ratzinger said: "The faith as such is always the same. Hence the Catechism of Saint Pius X always preserves its value. Whereas ways of transmitting the contents of the faith can change instead. And hence one may wonder whether the Catechism of Saint Pius X can in that sense still be considered valid today." Canon law in the Catholic Church varied from region to region with no overall prescriptions. On 19 March 1904, Pope Pius X named a commission of cardinals to draft a universal set of laws. Two of his successors worked in the commission, Giacomo della Chiesa, who became Pope Benedict XV and Eugenio Pacelli, who became Pope Pius XII. This first Code of Canon Law was promulgated by Benedict XV on 27 May 1917, with an effective date of 19 May 1918 and remained effect until Advent 1983. Pius X reformed the Roman Curia with the constitution Sapienti consilio and specified new rules enforcing a bishop's oversight of seminaries in the encyclical Pieni l'animo. He established regional seminaries (closing some smaller ones), and promulgated a new plan of seminary study. He also barred clergy from administering social organizations. Pius X reversed the accommodating approach of Leo XIII towards secular governments, appointing Rafael Merry del Val as Cardinal Secretary of State (Merry del Val would later have his own cause opened for canonization in 1953, but still has not been beatified). When the French president Émile Loubet visited the Italian monarch Victor Emmanuel III (1900–1946), Pius X, still refusing to accept the annexation of the papal territories by Italy, reproached the French president for the visit and refused to meet him. That led to a diplomatic break with France, and in 1905, France issued a Law of Separation, which separated church and state, and which the Pope denounced. The effect of the separation was the church's loss of its government funding in France. Two French bishops were removed by the Vatican for recognising the Third Republic. Eventually, France expelled the Jesuits and broke off diplomatic relations with the Vatican. The Pope adopted a similar position toward secular governments in other parts of the world: in Portugal, Ireland, Poland, Ethiopia, and a number of other states with large Catholic populations. His actions and statements against international relations with Italy angered the secular powers of these countries, as well as a few others, like the UK and Russia. In Ulster, Protestants were increasingly worried that a proposed Home Rule Ireland run by Catholics inspired by Pius X would result in Rome Rule. In 1908, the papal decree Ne Temere came into effect which complicated mixed marriages. Marriages not performed by a Catholic priest were declared legal but sacramentally invalid, worrying some Protestants that the church would counsel separation for couples married in a Protestant church or by civil service. Priests were given discretion to refuse to perform mixed marriages or lay conditions upon them, commonly including a requirement that the children be raised Catholic. The decree proved particularly divisive in Ireland, which has a large Protestant minority, contributing indirectly to the subsequent political conflict there and requiring debates in the House of Commons of the United Kingdom. As secular authority challenged that of the papacy, Pius X became more aggressive. He suspended the Opera dei Congressi, which coordinated the work of Catholic associations in Italy, as well as condemning Le Sillon, a French social movement that tried to reconcile the church with liberal political views. He also opposed trade unions that were not exclusively Catholic. Pius X partially lifted decrees prohibiting Italian Catholics from voting, but he never recognised the Italian government. Initially, Pius maintained his prisoner in the Vatican stance, but with the rise of socialism he began to allow the Non Expedit to be relaxed. In 1905, in his encyclical Il fermo proposito [de; it; la], he allowed Catholics to vote when they were "helping the maintenance of social order" by voting for deputies who were not socialist. Under Pius X, the traditionally difficult situation of Polish Catholics in Russia did not improve. Although Nicholas II of Russia issued a decree 22 February 1903, promising religious freedom for the Catholic Church, and, in 1905, promulgated a constitution which included religious freedom, the Russian Orthodox Church felt threatened and insisted on stiff interpretations. Papal decrees were not permitted and contacts with the Vatican remained outlawed. In 1908, Pius X lifted the United States out of its missionary status, in recognition of the growth of the American church. Fifteen new dioceses were created in the US during his pontificate, and he named two American cardinals. He was very popular among American Catholics, partly due to his poor background, which made him appear to them as an ordinary person who was on the papal throne. In 1910, the pope refused an audience with former Vice-President Charles W. Fairbanks, who had addressed the Methodist association in Rome, as well as with former President Theodore Roosevelt, who intended to address the same association. On 8 July 1914, Pope Pius X approved the request of Cardinal James Gibbons to invoke the patronage of the Immaculate Conception for the construction site of the National Shrine of the Immaculate Conception in Washington, DC. Other than the stories of miracles performed through the pope's intercession after his death, there are also stories of miracles performed by the pope during his lifetime. On one occasion, during a papal audience, Pius X was holding a paralyzed child who wriggled free from his arms and then ran around the room. On another occasion, a couple (who had made confession to him while he was bishop of Mantua) with a two-year-old child with meningitis wrote to the pope and Pius X then wrote back to them to hope and pray. Two days later, the child was cured. Cardinal Ernesto Ruffini (later the Archbishop of Palermo) had visited the pope after Ruffini was diagnosed with tuberculosis, and the pope had told him to go back to the seminary and that he would be fine. Ruffini gave this story to the investigators of the pontiff's cause for canonization. Pius X consecrates Bishop Giacomo Paolo Giovanni Battista della Chiesa, the future Pope Benedict XV, in the Vatican in 1907. In addition to the political defense of the church, liturgical reforms, anti-modernism, and the beginning of the codification of canon law, the papacy of Pius X saw the reorganisation of the Roman Curia. He also sought to update the education of priests, seminaries and their curricula were reformed. In 1904 Pope Pius X granted permission for diocesan seminarians to attend the College of St. Thomas. He raised the college to the status of Pontificium on May 2, 1906, thus making its degrees equivalent to those of the world's other pontifical universities. By Apostolic Letter of November 8, 1908, signed by the Supreme Pontiff on November 17, the college was transformed into the Collegium Pontificium Internationale Angelicum. It would become the Pontifical University of Saint Thomas Aquinas, Angelicum in 1963. Pius X published 16 encyclicals; among them was Vehementer nos on 11 February 1906, which condemned the 1905 French law on the separation of the State and the Church. Pius X also confirmed, though not infallibly, the existence of Limbo in Catholic theology in his 1905 Catechism, saying that the unbaptized "do not have the joy of God but neither do they suffer... they do not deserve Paradise, but neither do they deserve Hell or Purgatory." On 23 November 1903, Pius X issued a papal directive, a motu proprio, that banned women from singing in church choirs (i.e. the architectural choir). In the Prophecy of St. Malachy, the collection of 112 prophecies about the popes, Pius X appears as Ignis Ardens or "Burning Fire". In November 1913, Pope Pius X declared tango dancing as immoral and off-limits to Catholics. Later, in January 1914, when tango proved to be too popular to declare off-limits, Pope Pius X tried a different tack, mocking tango as "one of the dullest things imaginable", and recommending people take up dancing the furlana, a Venetian dance, instead. Pius X beatified 131 individuals (including groups of martyrs and those by recognition of "cultus") and canonized four. Those beatified during his pontificate included Marie-Geneviève Meunier (1906), Rose-Chrétien de la Neuville (1906), Valentin Faustino Berri Ochoa (1906), Saint Clarus (1907), Zdislava Berka (1907), John Bosco (1907), John of Ruysbroeck (1908), Andrew Nam Thung (1909), Agatha Lin (1909), Agnes De (1909), Joan of Arc (1909), and John Eudes (1909). Those canonized by him were Alexander Sauli (1904), Gerard Majella (1904), Clement Mary Hofbauer (1909), and Joseph Oriol (1909). Pius X created 50 cardinals in seven consistories held during his pontificate which included noted figures of the Church during that time such as Désiré-Joseph Mercier (1907) and Pietro Gasparri (1907). In 1911 he increased American representation in the cardinalate based on the fact that the United States was expanding; the pope also named one cardinal in pectore whose name he later revealed thus validating the appointment. Pius X also named Giacomo della Chiesa as a cardinal who would become his immediate successor Pope Benedict XV. In 1913, Pope Pius X suffered a heart attack, and subsequently lived in the shadow of poor health. In 1914, the pope fell ill on the Feast of the Assumption of Mary (15 August 1914), an illness from which he would not recover. His condition was worsened by the events leading to the outbreak of World War I (1914–1918), which reportedly sent the 79-year-old pope into a state of melancholy. He died on 20 August 1914, only a few hours after the death of Jesuit leader Franz Xavier Wernz and on the very day when German forces marched into Brussels. Following his death, Pius X was buried in a simple and unadorned tomb in the crypt below St. Peter's Basilica. Papal physicians had been in the habit of removing organs to aid the embalming process. Pius X expressly prohibited this in his burial and successive popes have continued this tradition. The statue of Pius X in St. Peter's Basilica. Although Pius X's canonisation took place in 1954, the events leading up to it began immediately with his death. A letter of 24 September 1916 by Monsignor Leo, Bishop of Nicotera and Tropea, referred to Pius X as "a great Saint and a great Pope." To accommodate the large number of pilgrims seeking access to his tomb, more than the crypt would hold, "a small metal cross was set into the floor of the basilica," which read Pius Papa X, "so that the faithful might kneel down directly above the tomb". Masses were held near his tomb until 1930. Devotion to Pius X between the two world wars remained high. On 14 February 1923, in honor of the 20th anniversary of his accession to the papacy, the first moves toward his canonisation began with the formal appointment of those who would carry out his cause. The event was marked by the erecting of a monument in his memory in St. Peter's Basilica. On 19 August 1939, Pope Pius XII (1939–58) delivered a tribute to Pius X at Castel Gandolfo. On 12 February 1943, a further development of Pius X's cause was achieved, when he was declared to have displayed heroic virtues, gaining therefore the title "Venerable". On 19 May 1944, Pius X's coffin was exhumed and was taken to the Chapel of the Holy Crucifix in St. Peter's Basilica for the canonical examination. Upon opening the coffin, the examiners found the body of Pius X remarkably well preserved, despite the fact that he had died 30 years before and had made wishes not to be embalmed. According to Jerome Dai-Gal, "all of the body" of Pius X "was in an excellent state of conservation". After the examination and the end of the apostolic process towards Pius X's cause, Pius XII bestowed the title of Venerable Servant of God upon Pius X. His body was exposed for 45 days (Rome was liberated by the allies during this time), before being placed back in his tomb. Following this, the process towards beatification began, and investigations by the Sacred Congregation of Rites (SCR) into miracles performed by intercessory work of Pius X took place. The SCR would eventually recognize two miracles. The first involved Marie-Françoise Deperras, a nun who had bone cancer and was cured on 7 December 1928 during a novena in which a relic of Pius X was placed on her chest. The second involved the nun Benedetta De Maria, who had cancer, and in a novena started in 1938, she eventually touched a relic statue of Pius X and was cured. Pope Pius XII officially approved the two miracles on 11 February 1951; and on 4 March, Pius XII, in his De Tuto, declared that the church could continue in the beatification of Pius X. His beatification took place on 3 June 1951 at St. Peter's before 23 cardinals, hundreds of bishops and archbishops, and a crowd of 100,000 faithful. During his beatification decree, Pius XII referred to Pius X as "Pope of the Eucharist", in honor of Pius X's expansion of the rite to children. The tomb of Pope Pius X under the Presentation chapel altar in Saint Peter's Basilica. Following his beatification, on 17 February 1952, Pius X's body was transferred from its tomb to the Vatican basilica and placed under the altar of the chapel of the Presentation. The pontiff's body lies within a glass and bronze-work sarcophagus for the faithful to see. On 29 May 1954, less than three years after his beatification, Pius X was canonized, following the SCR's recognition of two more miracles. The first involved Francesco Belsami, an attorney from Naples who had a pulmonary abscess, who was cured upon placing a picture of Pope Pius X upon his chest. The second miracle involved Sr. Maria Ludovica Scorcia, a nun who was afflicted with a serious neurotropic virus, and who, upon several novenas, was entirely cured. The canonization Mass was presided over by Pius XII at Saint Peter's Basilica before a crowd of about 800,000 of the faithful and church officials at St. Peter's Basilica. Pius X became the first pope to be canonized since Pius V in 1712. His canonization ceremony was taped and recorded by early television news broadcasters, including NBC. Prayer cards often depict the sanctified pontiff with instruments of Holy Communion. In addition to being celebrated as the "Pope of the Blessed Sacrament", Pius X is also the patron saint of emigrants from Treviso. He is honored in numerous parishes in Italy, Germany, Belgium, Canada, and the United States. The number of parishes, schools, seminaries and retreat houses named after him in western countries is very large, partly because he was very well known, and his beatification and canonization in the early 1950s was during a period of time following World War II when there was a great deal of new construction in cities and population growth in the era of the baby boom, thus leading to Catholic institutional expansion that correlated with the growing society. Pius X's feast day was assigned in 1955 to 3 September, to be celebrated as a Double. It remained thus for 15 years. In the 1960 calendar, the rank was changed to Third-Class Feast. The rank in the General Roman Calendar since 1969 is that of Memorial and the feast day is obligatorily celebrated on 21 August, closer to the day of his death (20 August, impeded by the feast day of St Bernard). The Confraternity of Christian Doctrine was a big supporter of his canonization, partly because he had ordained the need for its existence in every diocese and because it had received a great deal of episcopal criticism, and it was thought that by canonizing the pope who gave them their mandate, this would help inoculate against this criticism. They initiated a prayer crusade for his canonization that achieved the participation of over two million names. After the Pope's canonization, another miracle is said to have taken place when a Christian family activist named Clem Lane suffered a major heart attack and was placed in an oxygen tent, where he was given extreme unction. A relic of the Pope was placed over his tent, and he recovered to the great surprise of his doctors. A sister of Loretto at Webster College in St Louis, Missouri, claimed that her priest brother had been cured through the Pope's intercession as well. The personal papal arms of Pius X are composed of the traditional elements of all papal heraldry before Pope Benedict XVI: the shield, the papal tiara, and the keys. The tiara and keys are typical symbols used in the coats of arms of pontiffs, which symbolize their authority. The shield of Pius X's coat of arms is charged in two basic parts, as it is per fess. In chief (the top part of the shield) shows the arms of the Patriarch of Venice, which Pius X was from 1893 to 1903. It consists of the Lion of Saint Mark proper and haloed in silver upon a silver-white background, displaying a book with the inscription of PAX TIBI MARCE on the left page and EVANGELISTA MEUS on the right page. "Pax tibi Marce Evangelista Meus" (English: Peace to you, Mark, my evangelist) is the motto of Venice referring to the final resting place of Saint Mark. This differed from the arms of the Republic of Venice by changing the background color from red to silver even though that did not conform to heraldic rules. Previous Patriarchs of Venice had combined their personal arms with these arms of the Patriarchate. The same chief can be seen in the arms of the later popes who were Patriarchs of Venice upon election to the See of Rome, John XXIII and John Paul I. Renditions of this part of Pius X's arms depict the lion either with or without a sword, and sometimes only one side of the book is written on. The shield displays the arms Pius X took as Bishop of Mantua: an anchor proper cast into a stormy sea (the blue and silver wavy lines), lit up by a single six-pointed star of gold. These were inspired by Hebrews Chapter 6, Versicle 19, (English: "The hope we have is the sure and steadfast anchor of the soul") As Bishop Sarto, he stated that "hope is the sole companion of my life, the greatest support in uncertainty, the strongest power in situations of weakness." Although not present upon his arms, the only motto attributed to Pope Pius X is the one for which he is best remembered: Instaurare omnia in Christo (English: "To restore all things in Christ"), allegedly his last words before his death. The life of Pope Pius X is depicted in the 1951 movie Gli uomini non guardano il cielo by Umberto Scarpelli. The movie is centered on the year 1914, as the Pope grieves over the threat that is incumbent and is consoled by his nephew. A satirical depiction of Pope Pius X is presented in Flann O'Brien's novel The Hard Life, as the Irish characters travel from Dublin to Rome and gain a personal interview with the Pope, which ends very badly. In the poem "Zone" by Guillaume Apollinaire, Pope Pius X is referred to as "L'Européen le plus moderne." This page is based on the Wikipedia article Pope Pius X; it is used under the Creative Commons Attribution-ShareAlike 3.0 Unported License (CC-BY-SA). You may redistribute it, verbatim or modified, providing that you comply with the terms of the CC-BY-SA.